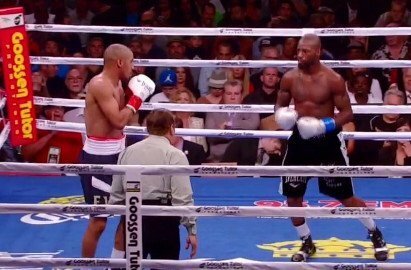 By Michael Collins: It’s safe to say that Chad Dawson (31-2, 17 KO’s) learned a tremendous lesson tonight about the dangerous of losing weight to fight out of his weight class. Dawson, 30, was completely dominated in every sense of the word by WBA/WBC super middleweight champion Andre Ward (26-0, 14 KO’s) in losing by a 10th round TKO at the Oracle Arena, in Oakland, California. Dawson was knocked down three times in this fight, if you want to call it fight. After the 3rd knockdown, Dawson told referee Steve Smoger that he’d had enough and the fight was halted. You don’t want to make excuses for Dawson, but it was hard looking at how poorly he fought and how weak he looked throughout the fight and not feel that he was perhaps weight drained from making the foolish mistake of agreeing to drain down to 168 lbs to take the weight. I’m betting that Dawson wishing he hadn’t done that right now because he really got a humiliating beating by Ward. This wasn’t even close after the 2nd. Ward was just battering Dawson with left hooks, right hands and hard body shots and Dawson just looked like he was trying to survive. He was getting badly punished in this fight and it’s too bad his trainer John Sculley didn’t step and stop the massacre by the midpoint of the fight because there was no reason to let the fight continue after the 6th round. Dawson had no chance other than perhaps landing a lucky punch to score a knockout. But with Dawson’s power completely gone from losing weight, he didn’t even had that chance. All he was really doing was just trying to survive and not hit so often. Ward knocked Dawson down in the 3rd, 4th and 10th rounds. There was really no reason for Dawson to agree to come down to 168 to make this fight. Dawson already had the WBC light heavyweight title, and he didn’t need to drain himself because he wasn’t badly in need of money like some fighters are when they agree to drain themselves to make weight in a lower division.